The 1600 series brine valve uses a 3/8” tubing line for smaller flows of brine and fresh water. Email customercare@fleckvalves.com to Order Now! The body of the valve contains the spring loaded piston rod for closing fluid flow and includes the stem guide the numbers are: #60029 for the 1.5” in/out 2850 valve. There is also a PVC 1650 brine valves as well as hot water versions of both. The valve has a separate screw on brine line flow control. Flow control #60020- 25 (1/4 gpm) and #60020-50 (1/2 gpm) have black labels. The red labeled flow control is #60020-100 for 1 gpm. On inspecting the flow control be sure it is free of any debris as it is a very reusable part. This valve is always under line pressure and if it fails to close it generally results in a constant water flow back to the brine tank. The body of the valve contains the spring loaded piston rod for closing fluid flow and includes the stem guide the numbers are: #60029 for the 2” in/out 2900 and 2900S series Fleck control valves. There is also a PVC 1650 brine valves as well as hot water versions of both. The valve has a separate screw on brine line flow control. Flow control #60020- 25 (1/4 gpm) and #60020-50 (1/2 gpm) have black labels. The red labeled flow control is #60020-100 for 1 gpm. On inspecting the flow control be sure it is free of any debris as it is a very reusable part. The body of the valve contains the spring loaded piston rod for closing fluid flow and includes the stem guide part#60037 for a 9500 series. This brine valve is a two part valve with body #60037 containing the moving parts and the back portion of the valve that connects to the injector tubing is the flow control #60020-??. 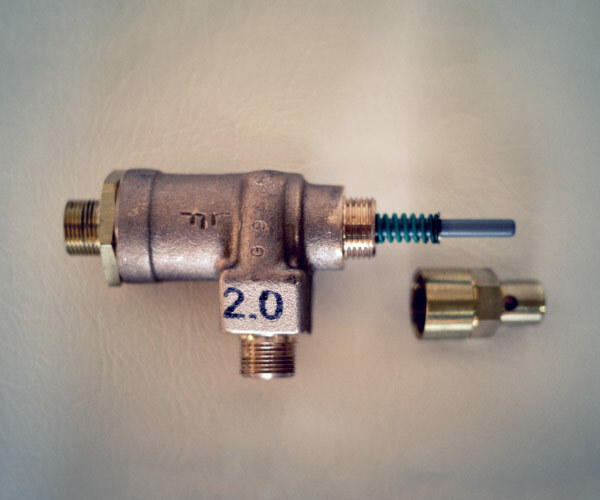 After the dash the flow control can be specified as .25 gpm -25 or 0.50 gpm ½ gpm or -100 for 1 gpm. The picture of this 9500 shows a red label on the flow control portion indicating that it is 1 gpm #60020-100. 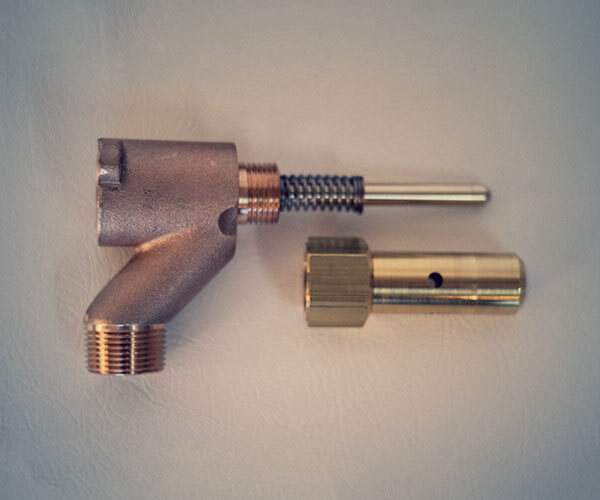 The brine valve is always under line pressure and only opened by a cam rotating to push the brine valve stem during brine and slow rinse or brine tank refill. If this stem fails to close it will continuously run water into the brine tank. The 1700 series brine valves use a ½” tubing connection for brine and fresh water flow. This valve is also used on the 1.5” in/out 2850 where a larger resin tank is used. The brine valve assembly contains an internal flow control with the gpm size stamped in black on the top of the casting. This can be up to 5 gpm (5.0) depending on the size of the softener. Ordering parts for the 2850 series 1.5” in/out use #60034-20 for the 2 gpm assembly or 1.2 –1.5 –2.4 –3.0 – 4.0 –5.0. The PVC version is a 1710 series. This valve is always under line pressure and if it fails to close it generally results in a constant water flow back to the brine tank. This valve is also used on the 1.5” in/out 2900 and 2900S where a larger resin tank is used. The brine valve assembly contains an internal flow control with the gpm size stamped in black on the top of the casting. This can be up to 5 gpm (5.0) depending on the size of the softener. Ordering parts for the 2900 or 2900S series 1.5” in/out use #60034-20 for the 2 gpm assembly or 1.2 –1.5 –2.4 –3.0 – 4.0 –5.0. The PVC version is a 1710 series. This valve is always under line pressure and if it fails to close it generally results in a constant water flow back to the brine tank. This larger valve is used on the 1.5” in/out 9500 series twin fleck control valve as #60039-?? The brine valve assembly contains an internal flow control with the gpm size stamped in black on the top of the casting see the 1700 series picture. This can be up to 5 gpm (5.0) depending on the size of the softener. Use #60039-20 for the 2 gpm assembly or other gpm flow rates are 1.2 –1.5 –2.4 –3.0 – 4.0 –5.0. The PVC version is a 1710 series. Again this valve is always under line pressure. If this stem fails to close it will continuously run water into the brine tank. 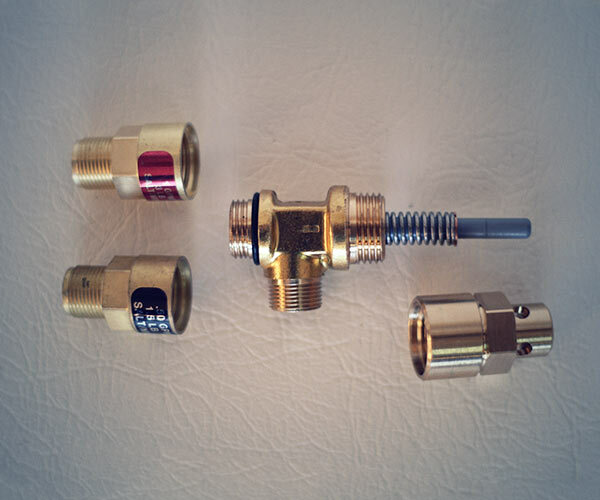 The 1800 series brine valve uses a 1” male pipe threaded fitting for attaching a PVC line to the brine tank . When installing the brine line we suggest that you place a union fitting close to the brine valve for future trouble shooting. The 1800 brine valve assembly is used on the 2” in/out 3150 fleck control valve. There is no internal flow control for regulating the brine tank refill rate. You must use a separate flow control on the brine line and it can range from 2 gpm to 20 gpm depending on the resin tank size. #60036-02 is the complete assembly as shown. The 1800 brine valve assembly is used on the 3” in/out 3900 fleck control valve. There is no internal flow control for regulating the brine tank refill rate. You must use a separate flow control on the brine line and it can range from 2 gpm to 20 gpm depending on the resin tank size. Fleck® is a trademark of Pentair, Inc. FleckValves.com is an independent sales site of an independent distributor. Manufacturer’s specifications and pricing are subject to change without notice. We try to stay current but please reconfirm when ordering.